The July 1st centenary of the First Battle of the Somme in WWI prompted me to re-visit the research I’ve done on my husband’s uncle, Victor Robert QUESNELL, who died in France shortly before the end of the war. My first post in early 2012 was about Victor, but I had failed to order his service record so, all this time later, I still didn’t know how and where he had died. A request for his record may take weeks to process, and I was anxious to find out what I could before that. Since I last looked, Ancestry.com had added two databases that included Victor. Both of them indicated that, rather than dying in action, he had died on 23 Oct 1918 of wounds received in battle. According to the excellent site “The Long Long Trail,” the South African Brigade by this time had been folded into the 66th (2nd East Lancashire) Division. As part of the Fourth Army, this division fought from 17-20 Oct 1918 in the Battle of the Selle. Victor was buried in the Roisel Communal Cemetery Extension, which according to the Commonwealth War Graves Commission, ” …was developed in October and November, 1918, by the 41st, 48th, 53rd and 58th Casualty Clearing Stations…” As a wounded soldier, he would likely have passed through one of those clearing stations. A search on <world war one 41st casualty clearing station> took me directly to the painting shown below by war artist J. Hodgson Lobley which is held by the Imperial War Museums. I realized that any of the men depicted could have been Victor as a wounded soldier waiting to be moved to a hospital. Or he might already have died sometime between being tended to first at a Regimental Aid Post and then at an Advanced Dressing Station, both closer to the front line. I would like to think that Victor spent his last hours in such clean and comfortable surroundings, but paintings by Lobley and others lead me to believe that this is a tent for wounded officers, not enlisted men. Showing red rather than olive drab blankets on some beds would appear to be artistic license on the part of Sargent. However, a quick online search shows that red blankets are used in some modern hospitals, either for patients in critical condition who should be rushed directly to emergency surgery or for those who qualify for VIP treatment. One can imagine one or both of these criteria at play in the British Army of the time. When writing about deceased family members, a family historian tries to convey the atmosphere of their lives, usually by detailed descriptions based on research into the period. In the absence of a photo of Victor, these paintings may come as close as possible to picturing this young man who died too soon. Every genealogist should have a plaque prominently displayed on her desk: “Keep searching — you can never have too many documents!” A recent finding illustrates the thinking behind this admonition. The burial place of Joseph Robert QUESNELL, the head of the family, remained unknown. 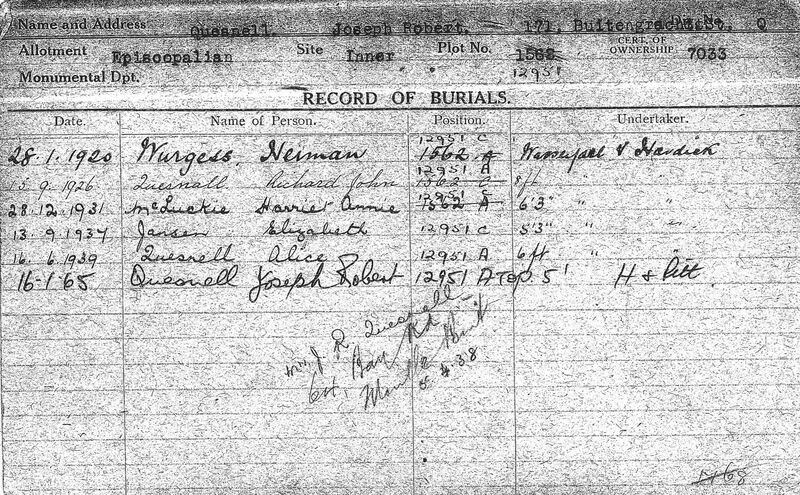 However, the recently obtained Record of Burials maintained by the Maitland Cemetery shows that he was indeed buried with the rest of his family, although his name and death date, 14 Jan 1965, have never been added to the gravestone. This document may not be complete; it does not list either Esmé Doris or an unnamed infant daughter who died shortly after birth in 1914, both of whose death certificates give Maitland Cemetery as the intended burial place. However, much to my surprise, the plot does contain the graves of three other relatives. 1) Herman WÜRGES (d. 27 Jan 1920) — Alice’s father. All I had known was his name and that his wife Sarah Maria (surname unknown) was a widow when she died 13 Sep 1920 in Port Nolloth. I assumed that her husband had also died there, but I had been unable to find him in either civil records or church burial records. Now armed with his burial date and place, I was able to find his death certificate (with the surname spelled and indexed as Wurgiss) in the “Cape Province, Civil Deaths, 1895-1972” database at FamilySearch. It states that after more than five months of illness, he died of “a cancer in [the] neck and exhaustion” at Old Somerset Hospital. Why he died so far from where he and his wife lived is a matter for speculation. His occupation was “boatman” so perhaps he had been on a ship docked in Cape Town when he fell ill. Perhaps his cancer was of a type or severity that required treatment in a larger hospital than the one in Port Nolloth. Sarah died only seven months after her husband; perhaps she had been too ill to care for him so their only child, Alice, had taken him into her home. Both Herman and Sarah were only 58 years old when they died. 2) Harriet Annie QUESNELL (d. 26 Dec 1931) — Joseph Robert’s sister. Although her death certificate states that she is married, her residence address is that of her brother, 171 Buitengracht Street, Cape Town. Her first marriage was to John HAMER; I’ve been unable to find out whether they had any children and whether he died or their marriage ended in divorce. At the time of her death, her surname was MCLUCKIE. Her death certificate was signed by A. MCLUCKIE, presumably her husband, who gives the same address. 3) Elizabeth Mary QUESNELL (d. 12 Sep 1937) — Joseph Robert’s sister. Elizabeth was the widow of William JANSEN, a seaman from Finland who had died in 1915 in Port Nolloth. Her Death Notice shows only three of her six children as still living: Edgar Ernest (b. 1895), Edith Gladys (b. 1898), and Arthur Alexander (b. ?). She has a separate headstone. From now on, my research will always include cemetery burial records. These unassuming little cards can not only save time searching for a death date with which to browse un-indexed South African death certificates and probate records, but can lead to unexpected information. I’m already considering what might be found in mortuary records, another under-used resource. After the death of Alice WÜRGES, Joseph Robert QUESNELL married Charlotte Louisa VAN REENEN 27 Jan 1942. She died 12 Mar 1962. According to a transcription on the now-defunct site Ancestry24, she was buried in St. Peter’s Cemetery in Observatory, a suburb of Cape Town. Unfortunately, although Ancestry24 was purchased by Ancestry.com, many of their databases have yet to be made available on the latter’s site. The cemetery has been replaced by a shopping mall, but I have read that the gravestones were photographed by the National Heritage Council before that event. The database “South Africa, Cape Province, Civil Deaths, 1895-1972” on FamilySearch is not yet complete; the last records are from 1954, and the database has not been updated in the past year. It is only partially indexed. 1) Two positions, A and C, are noted on the Record of Burials, but a photo shows the plot with three grave sites bordered by a common concrete curb. Contact the cemetery office to find out where B is located in relation to A and C and who is buried in position B. 2) Six burials — eight including the unrecorded children — would have necessitated multiple burials in each grave. This also seems likely from the notations of depth ranging from 5 to 8 ft. for all but the grave of Herman WÜRGES. Contact the cemetery for clarification. 3) Since Joseph Robert QUESNELL and his only surviving son, my husband’s father, had been estranged for some years, there is a question about who arranged for the burial. “H & Pitt” is listed as “undertaker” for the burial; an online search suggests that this is Human & Pitt Funeral Services with several locations in the Western Cape. Contact the location in Cape Town to get a copy of the pertinent record. 4) Check the availability of the National Heritage Council photographs of the gravestones from St. Peter’s Cemetery, Observatory; the location of the cemetery records, and the current location of the remains that were removed. There’s nothing like a tempting new genealogy mystery to keep enthusiasm running high! A two-part article published last year in Genesis by the Genealogical Society of South Africa had shown that my husband’s 6x great-grandmother, Sara Magdalena, was “probably not” the daughter of Andreas OELOFSE, although her mother Sara JANSZ was his wife and likely his widow by the time of the child’s baptism (see earlier post). The author’s reasons did not fully convince me, possibly because I was still hoping that mutineer and convict-at-hard-labor Andreas would be a good candidate for family black sheep. And I thought there was enough “wiggle room” in his timeline to allow the possibility that he was the child’s father, but that she had been born after his death. However, Anne Clarkson, a researcher in Cape Town who has wide experience working with early records from the Cape, reviewed the research and was persuaded by the evidence, especially the baptism record, a copy of which she forwarded to me. So I bowed to Anne’s superior experience. But that didn’t mean that I sighed and turned to other matters. In fact, after the initial deflation of acknowledging that Andreas was not in the family line, I perked up to the challenge of finding out the identity of Sara Magdalena’s “unknown” father. The baptism record kept nagging at me. Why did her mother decline to name the birth father? It’s not difficult to imagine that in a town the size of Stellenbosch, most of the town, including the minister, would have known the father’s identity. But for some reason, they weren’t divulging this information for the record. A logical explanation might be that the natural father was a person of some standing in the community and thereby considered above the law and that neither Sara JANSZ nor the minister was prepared to face the consequences of naming him. The second Genesis article gave one clue to follow. Widow Sara JANSZ’s estate inventory of 12 Jun 1713 listed her and Andreas’s seven children in descending birth order, all with the surname OLOFSZ. At the end of the list was her youngest child, Sara [Magdalena], with the surname MEURS. Assuming that this was the surname of the child’s father, was she listed with this surname because the inventory was a legal document with negative consequences for incorrectly stating information? Or was the natural father dead by the time the inventory was drawn up? Fortunately, the author of the Genesis articles cited www.tanap.net as one of her sources. The TANAP site showed two searchable databases for the Cape of Good Hope. The first, Inventories of the Orphan Chamber, listed four documents for the years 1709 and 1710 in which a man named Samuel Martini DE MEURS bought property from the estates of deceased persons. He is the only person of that surname in these records. In the last three documents, his title is given as landdrost, or chief magistrate of the district. The other TANAP database, Resolutions of the Council of Policy, yielded six documents with dates ranging from 7 May 1707 to 11 Mar 1710 in which DE MEURS is listed as the landdrost. Three additional documents in the years 1716, 1720, and 1724 mention his “widow” Aletta BECK who had remarried in Dec 1715. Church records show that she and DE MEURS had married in 29 Dec 1709, eight months after Sara Magdalena’s baptism. What might have been the effect on both his position in the government and his impending marriage if it had been known that he had fathered an illegitimate child? Studying the timeline of events, it appears that Sara Magdalena’s mother and DE MEURS were probably involved in an adulterous affair prior to the death of OELOFSE, thereby adding to the scandal that likely would have resulted from an open admission of paternity. My reasoning about Sara Magdalena’s baptism record seemed to have some validity. Samuel DE MEURS was an important personage in Stellenbosch. An online biography of Aletta BECK states that she was the sister-in-law of a Dutch East India Company (VOC) official, thus making it more likely that her husband-to-be would have wanted to keep secret his fathering of a child. BECK’s biography also indicates that “as early as the beginning of 1711,” DE MEURS had died following a long illness, which supported my reasoning that Sara JANSZ’s inventory listed her youngest child’s surname because the birth father was no longer alive. I was convinced that I had found Sara Magdalena’s father. Hoping that Anne Clarkson would concur with my conclusion and also find additional supporting documents in the archives, I compiled the above information and was preparing to send the list to her in Cape Town. But, right before e-mailing the document, I did a final online check on DE MEURS — with astonishing results! TANAP is an acronym for Towards A New Age of Partnership in Dutch East India [VOC] Archives and Research. Two of its objectives are to preserve the VOC archives and improve accessibility to them. There are two searchable online databases for the Cape of Good Hope: 1) Resolutions of the Council of Policy – The Council of Policy was the highest authority of the VOC at the Cape of Good Hope. The Council discussed all problems that arose and took decisions on governing the settlement. The minutes, which include reports and decisions taken, are called the Resolutions of the Council of Policy. The transcriptions of these documents are available on the site, and 2) Inventories from the Orphan Chamber – The establishment of the Orphan Chamber at the Cape of Good Hope arose out of the need to provide for the collection and administration of the property of persons who died intestate and left heirs who were absent from the Colony or who were under age. The biography of Aletta BECK, wife of Samuel Martini DE MEURS, is included in Digitaal Vrouwenlexicon van Nederland (DVN), an online dictionary of Dutch women. It states that Aletta was the “only heir” of DE MEURS. Try to locate a probate or inventory record for the estate of Samuel Martini DE MEURS.